I’d like to consider myself your average, run of the mill thirty something. I wake up, go to work and come back home like any other red-blooded, taxpaying American. I am becoming increasingly aware, however, that most of what I consider to be standard weekend nightlife activity is not doing me or my health any favors. After years of cheese fries and buffalo wings being the only thing between my liver and an onslaught of an untold number of sugary, overly-caffeinated alcoholic drinks, part of me is turning to more sustainable behaviors as I quickly approach my 40s. “We’re meeting on the baseball diamond at 5,” the instructions said. “Park behind Right Field and DON’T BE LATE!” I give myself a 15 minute cushion because, please… I’m a responsible adult. I am WAY beyond all the careless and haphazard decisions of my youth. Meanwhile, I follow my GPS directions to find a single file line of cars 2 miles long directly in front of the entrance. Ok, panic. Text the Event Leader to cover my tail, plead with the parking attendant not to charge me for parking… By this point, I already feel the bass rumble from our massive sound system as I duck under a broken fence post and arrive on the field just in the nick of time. “Glad you decided to join us,” I hear behind a wall of Electronic Dance Music and cheers. The rest of the Event Team had arrived hours earlier to survey the site, unload the trucks, and setup over 5 tons of Professional Grade Sound and Stage equipment. “This is just the pre-party. We’re expecting over 11,000 runners, tonight.” Over 11,000?!? On a cold and windy February afternoon? Why had I never considered this? 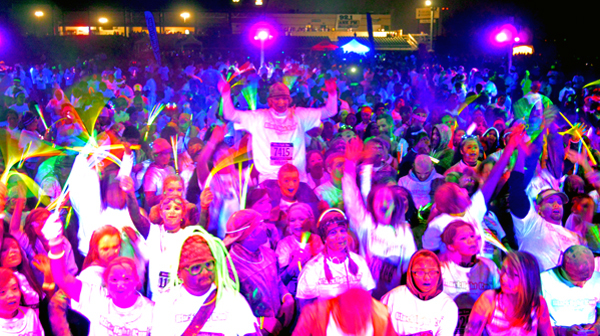 As the runners finish the 5k black light run distance, they file back toward the stage on the baseball diamond. It’s dark now, and what was just bits of flair is now a glowing sea of bright neon colors. I’m having flashbacks to all the raves and outdoor tent parties I’ve been to, but this party has a different vibe. Take all the magic and power of the biggest warehouse parties you went to in college, remove the sketchy and dangerous elements, add a free range, grass fed kale shake or two – and what you’re left with is a pretty good description of a Black Light Run. Loud music, pretty people, glow sticks, but what do we have here? Clean bathrooms? A safe family environment? Concession stands? It IS a rave party… only grown up! The DJ effortlessly mixes underground dubstep with Katy Perry to the delight of the crowd. A hype man on stage is throwing out handfuls of glow-in-the-dark party favors, as fast as he can. What happens next was MIND BLOWING. After a knowing look to the DJ and the crowd, the hype man begins a count down from 10. It’s my first Black Light Run, so I look around as the crowd joins in. 3..2..1..
BOOM! 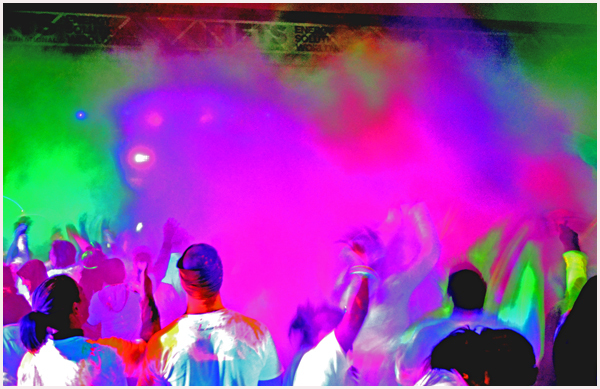 The beat drops as clouds of neon colored powder (I later learned is treated corn starch) envelopes everything in sight. I can’t see the hand in front of my face but I can feel the crowd explode with energy as they disappear behind the cloak of colored fog. As the neon dust settles and the stage and lights slowly come back into focus, it dawns on me. THIS IS REALLY FUN! Looks like I’ll be spending more time with my new co-workers at In Depth Events! How our Production Crew Turns a Live Event into a Glowing Marketing Extravaganza! Understanding what events work and which never live up to the hype takes walking a very fine line. Now, more than ever, our live event marketing industry is looking for new, unique and innovative ways to get their clients and brands message across to event attendees. How does a marketing firm create this type of environment? They need help from innovative production companies! It’s important to choose a production company that has experience working with marketing firms. 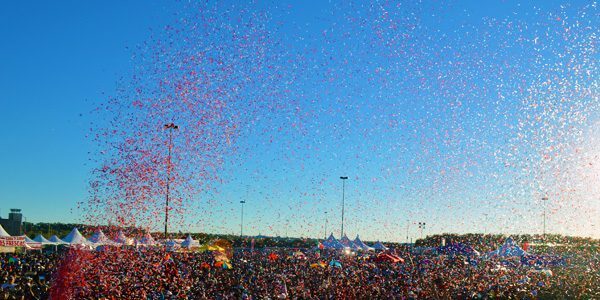 Only the two combined can create strategies that will incorporate the experiential components essential in making a truly successful (and memorable) live event. 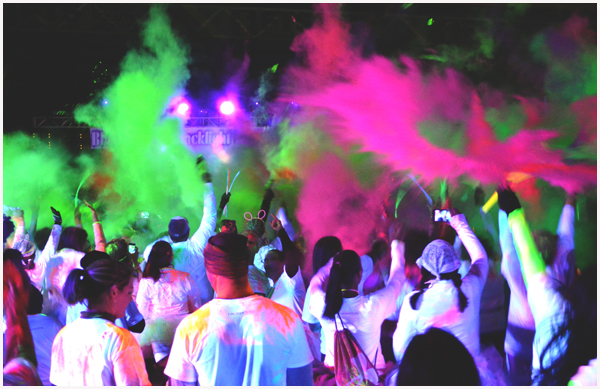 A great example of our willingness to work with clients on experiential event trend is our Black Light 5K’s. 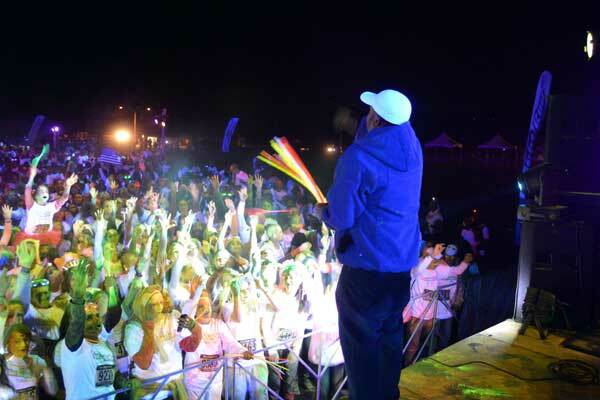 At In Depth Events, we provide several clients with the live glow events elements necessary to cover crowds of up to 15,000 with high intensity UV in outdoor environments. These events are executed nationwide – offering a unique and memorable experience for all guests from all demographics. Event though my title is Live Event Market Manager, I was recently invited to help our crew build a Black Light 5K in Pomona and have a new found respect for the hardworking technicians that are my co-workers. It starts with the team setting up the stage and trusses the night before in the center of the race track. It takes about 4 1/2 hours to complete the 20 foot x 20 foot stage and ADA ramp. It’s braced, locked in place and reinforced to provide stability for the DJs. And it’s built level on very un-level grassy ground. While the stage was being built, another crew built trusses at the start and finish lines of the race. This involved setting up pieces that were 20 ft. high with black lights being secured to all sides of the structure to create the glow effect the client required. The next day the team returned at 8am to continue the build. 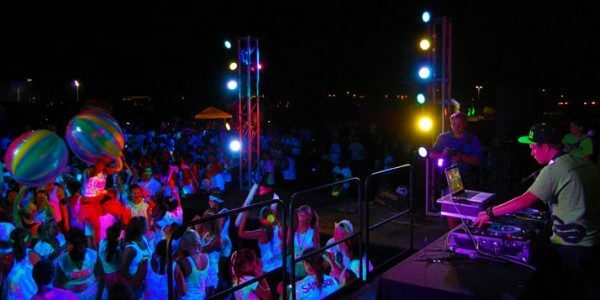 They had their work cut out for them as they began creating peripheral staging to hold additional speakers to enhance and magnify the ultimate sound experience for the Black Light run participants. 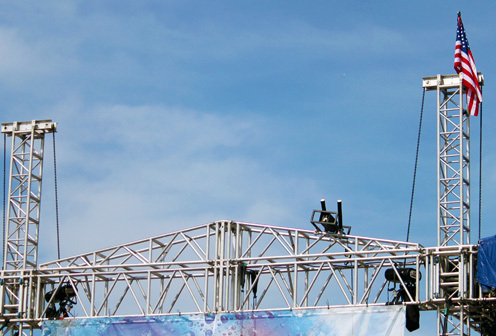 They set up 2 mini stages directly behind the main stage to literally pump up the volume. This turned out to be essential as the crowd far exceeded the expectations of the organizer! 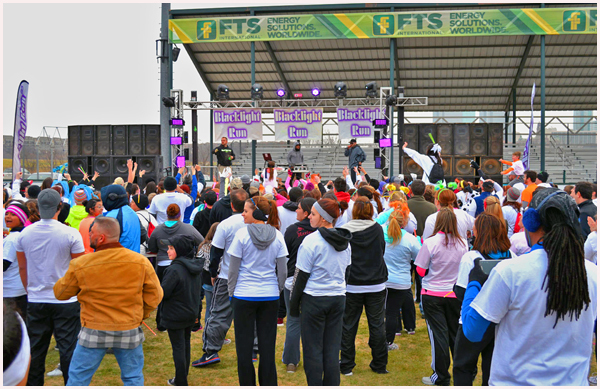 Lighting and fog equipment for live glow events has to be secured to additional trusses that were placed on stage to help create the ultimate dance party experience which occurred directly after the run portion of the event. While half the team continued to finish setting up the sound system, lighting, and black lights for the main event area, the other half of the production crew had to set up even more trusses, lighting and audio at four additional locations throughout the run path. Attendees began arriving at 4 pm and the gates were opened at 5 pm. The first wave crossed under the start line at 6:30 pm, and, after completing the race, went straight to the party area where the DJ’s were pumping music into the crowd. On entry to the party area, each attendee was given packets of UV reactive powder to throw in the air, on their friends or themselves! 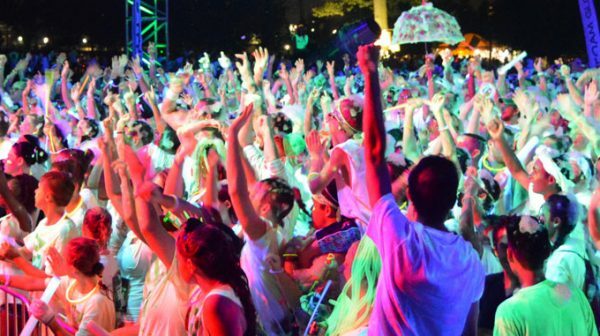 During the event, nearly 15,000 attendees showed up to Glow the night away under the high intensity, long throw black lights that were set up by our crew. These attendees came from every demographic and included every age group. However, the primary demographic seemed to be young couples with kids, definitely in the middle to upper income range and fitness minded. It was hard to see who was having more fun – the 30-something parents or the 12-17 year old kids at the stage barricades! 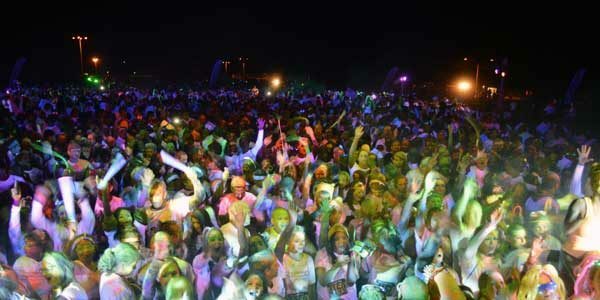 Everyone was dancing the night away, glowing in UV reactive clothing and covered in UV reactive paint. How to turn the Black Light Run into a promotional vehicle for my clients’ brands. Since I was a guest on the production crew, I also was privileged enough to help with load out – and, I gotta tell you, it comes down much faster than it goes up! While I was working with the technicians, my mind turned to how I could use this event experience to promote my clients brands. 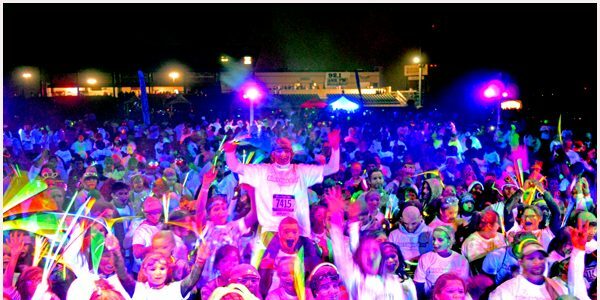 Would live glow events work for promoting a sports brand? What about a non-profit? Can a glowing logo make a better impression than a print logo? Which of my clients would be interested in having their product presented at such a unique event in front of 15,000 consumers with disposable income? The answer is, of course – all of them! But how best to utilize my new-found knowledge to help my clients? A sports drink client could certainly do giveaways. A sporting manufacturer could certainly give away UV reactive t-shirts. 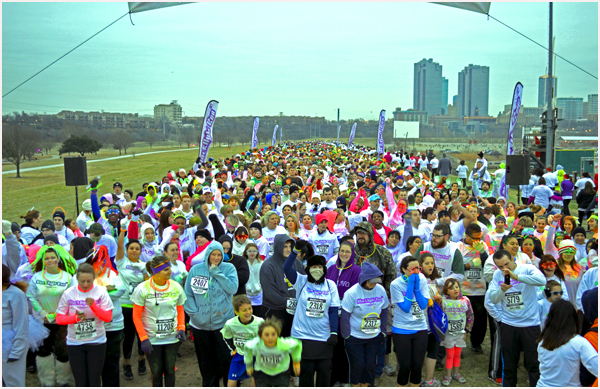 What if a client was willing to build an entire event to promote their brand? 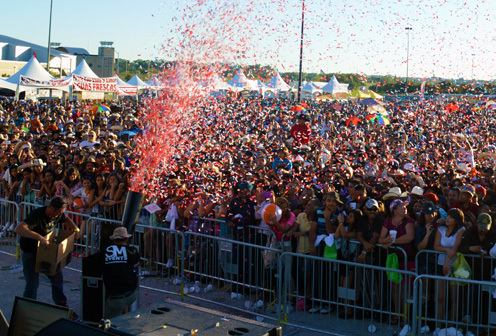 With a dedicated base of customers, a well-planned event could generate significant impressions for any of my clients. As I limped back to my car with the loaded trucks behind me, I was thankful that I do live event marketing for a living, and not production setup! I’ll be reaching out to my clients with my new ideas – and with the crew of In Depth Events in my back pocket, you’ll be sure to see my clients brands glowing soon! I hope this blog has been informative for our event planner clients! For more information on In Depth Events and our event production capabilities, please Ask Us a Question today. We look forward to hearing from you and working with you on your event!